Service- NWKRTC Airavat Gold Class. After spending two beautiful days at Hubli, It was time to return back home. I decided to book my return tickets from Hubli and the same was done a week ago keeping in mind the rush factor as well as heading back to work on Monday. A couple of days later Deepak Srinivas decided to join me in Hubli. As planned we both booked our tickets on Airavat Gold Class and were all set to enjoy a comfortable ride back home however I was eagerly waiting for surprises. After an eventful day, in Hubli, thanks to Prashant Kallimath, we headed out to the new bus stand in Hubli to board our ride back home. The scheduled departure of the bus was at 14:00hrs and there were around 20-25passengers boarding this bus from this point. As we waited patiently, the clock silently ticked passed 14:00hrs. Another 15minutes passed by and there was no sign of the bus. Slowly the passengers started getting restless and started calling the conductor. The conductor responded everyone’s call stating that the bus was in Gokul road and will be reaching shortly. Another 10mins passed by and finally she showed up. The restless passengers started to crowd up around the bus and mobbed the conductor with their cellphones and tickets as soon as he got down from the bus. The bus was running full with most of the passengers heading to Chennai from Belgaum and there was just one seat left which eventually was also taken. Me and Deepak bid adieu to Prashant Kallimath and boarded the bus and headed towards our seats. As we were settling down, the bus started moving out of the bus stand. An old movie was being playing on the entertainment system, while the movie kept the passengers engrossed to the TV sets, the bus slowly made its way into Hubli old bus stand. We picked up another set of passengers here and we pulled out from the bus stand within minutes. Next stop was at Kamat Upachar, Varur. I was eagerly looking forward for this stop as hungriness was slowly starting to creep in. The bus came out of Hubli was doing a decent speed heading towards Varur. We finally pulled into the restaurant and we were greeted by a Gujarat bound VRL sleeper and another VRL B9R. The place was filled to the brim. With a B9R sleeper on one side and hunger on the other it was a difficult choice yet decided to concentrate on the lunch. The place was very crowded and by the time we finished our Lunch, both the buses left. We came out and started to click the pictures of the bus and few senseless passengers were ruining our pictures by walking right infront of the frame. Finally we moved out of the restaurant and I was looking for a comfortable journey but surprises were very much in store for me…!!! 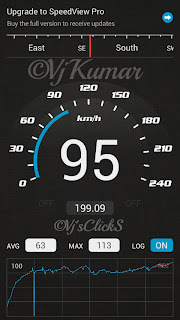 The bus was constantly doing speeds of around 80-85kmph and we crossed Haveri very quickly. I finally decided to the head out at the front and enjoy the ride upfront. A couple of minutes later Deepak joined in and we were having a nice time however something was amiss. The bus just kept doing speeds of 80-85kmph. 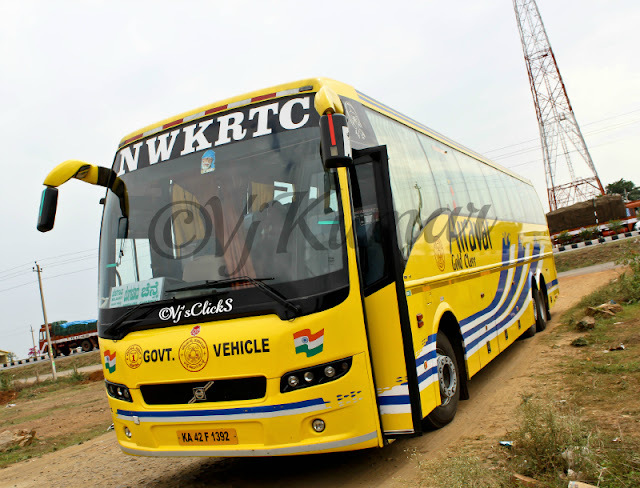 However when the bus departed from Kamat she did speeds of 95kmph. Finally curiosity crept into me and I asked the crew if the bus has a speed governor in place. The crew’s face said it all. Apparently the bus was locked at 85kmph and to ensure the bus reaches Bangalore on scheduled time and further reach Chennai on time, the crew skips tea-break stops before reaching Bangalore. When asked what time we would be reaching Bangalore, the driver mentioned around 21:00hrs. Though the bus was doing very low speeds, we were covering ground quickly. The bus simply lacked speed and it was being overtaken by express buses and finally at one point of time, a 600cc Tata Nano ended up overtaking our 9ltr monster from the left side and vanished, yet our bus crawled like a Turtle on the highway. We reached Chitradurga by around 18:15hrs and we kept on crawling. One thing was now evident; it was practically impossible to reach Bangalore at 21:00hrs. We were nearing Tumkur when heavy rains accompanied us. However the rains hardly impacted the speeds of our bus. The rains receded and so did our speed to 65kmph. 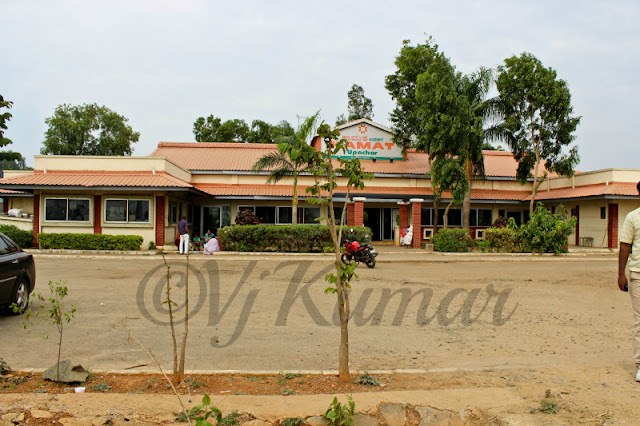 We crossed Tumkur at around 20:15hrs and the crew showed no sense of urgency. Sadly they could do nothing as the fate was sealed the very same day when the bus was locked for a speed of 85kmph. We finally entered the Yeswanthpur express way and were dropped at Navrang at around 22:15hrs. With a journey time of 8hrs for a mere 400kms ride is simply ridiculous. My friend Punyakeerthi, who took a Rajahamsa the previous night reached Bangalore in 7hrs, 45mins. I really felt sorry for the crew who takes the ire of the passengers. I will rather take an express service next time than boarding this service as it is both cost effective and they reach Bangalore on scheduled time.